When I run Wandering Heroes of Ogre Gate or when I've run one of my d20 wuxia campaigns, I've noticed that knowledge and interest in the genre varies considerably from player to player. This usually isn't a problem at all but sometimes people feel a bit frozen if they don't get all the genre conventions (they don't know what to name their character, what personality to create for themselves, what sorts of goals they should have). Obviously as the GM you can instruct people in these things but I find nothing beats directing folks to the source material and letting them formulate their own ideas. With that in mind here are some tips and movie/book/website suggestions for players who have little or no familiarity with wuxia. 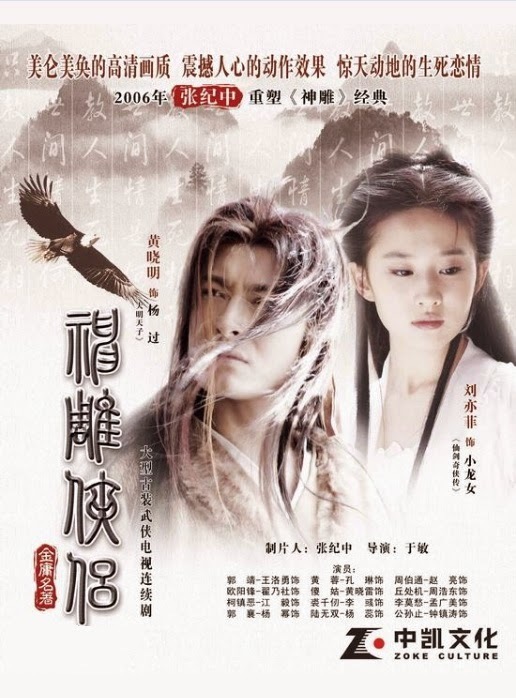 In an ideal world, you would get your players to watch all 41 episodes of Return of Condor Heroes, but that is a huge time investment and I've found people new to the genre are reluctant to watch such long series. But these shows are great for showing players what wuxia is all about. What I've found works well is sending them clips to the 3 minute musical intros. Most people can manage three minutes and it gives them a nice quick overview of kung fu techniques and dramatic moments. In some cases my players have been intrigued enough to continue watching after the introduction. This is a great website a strong emphasis on wuxia and ancient Chinese television series. Operated by a wuxia fan whose knowledge of the genre is encyclopedic, there are a number of cool resources available here, including regular articles that talk about the wuxia in real, every day terms. She keeps it positive and has an uplifting approach I enjoy. No snark just fun articles that cover everything from food and costumes to martial arts techniques and character types. Note: Since the original writing of this post, Wuxia Edge is no more. I will post a part 2 for this topic with an expanded list of current places to find material. Come up with a list of movies that you recommend to players. When I make such recommendations I tailor them to the person but also have a few stock suggestions that I feel are good intros to the genre. I try to come up with films or shows that I think the person can connect to. I usually don't recommend all of these at once. Rather I suggest two or three off the top of my head and then throw in a suggestion that I know will have more appeal to a fan of fantasy RPGs (which most of my players are) like Detective Dee and the Mystery of the Phantom Flame, The Sorcerer and the White Snake, Flying Swords of Dragon Gate or Painted Skin. I find film quality is important when making these sorts of lists for people because if a person's first introduction to a genre is something grainy and hard to see (even if it is the best film in the world), that can turn them off. So New Dragon Inn is probably the most grainy thing on the list I include. Most of the other movies it is pretty easy to get a good version of (though I'd steer them away from the Netflix version of Swordsman II because that is pretty grainy). There are lots of other movies I would want to suggest to people but I know they are either hard to obtain or not very well preserved. Your list might vary. I think whatever it is the idea is to find accessible movies you also really enjoy yourself. Once in a while you could do a movie night if your group is up for it. If they have the endurance for two to three movies back to back, that could be a great introduction to the genre. If your players have expressed interest after seeing a wuxia series introduction, then you may want to steer them toward a full series on a platform like Viki.com. I usually recommend the 2006 Return of Condor Heroes and 2003 Heavenly Sword and Dragon Saber to my players first, mainly because I like them and they are not so old that the image quality has been compromised yet (I've had a lot less luck recommending series from the 90s to people simply because the image and sound is often not in the best shape). Some players respond better to more recent series made in the last 5-6 years. These do tend to be cleaner looking because they are new, so that is a big advantage. The 2013 Demi-Gods and Semi-Devils seems to have gone over well with one of my players. 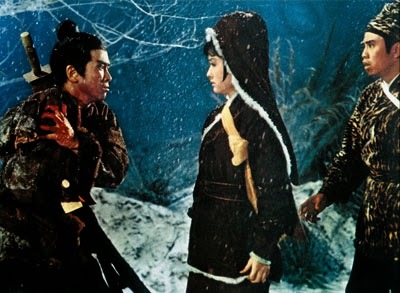 People seemed to like the Swordsman too (same year) and Strange Hero Yi Zhi Mei. There is also a divide among fans worth pointing out here over series made in Hong Kong prior to the transfer of sovereignty in 1997 and the ones made in mainland China today. I don't think it is my place to weigh in on that debate but it is simply worth mentioning that a lot of fans see the series produced prior to 1997 as superior to those produced afterwards. In my view these series are some of the best for finding game inspiration. But they are long and require the time investment. Plus they can be hard to find on online platforms. I've started many series only to discover that it was no longer dubbed in English after the 15th episode (which is really frustrating once you are invested). You can buy many on blue ray or DVD but not all, and older ones often end up being really pricey. It is very hard to get wuxia material in print in English. A lot of it is available through fan translations online but I find folks are a bit hesitant to read stuff like that (particularly since a lot of it is difficult to find or comes in quirky formatting). Know there are really good fan translations if you want them. 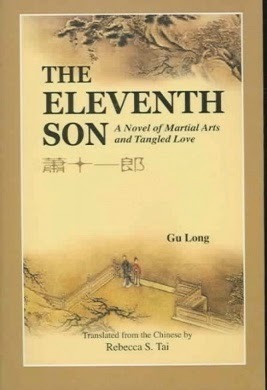 A few have been put into print in English though and of them I highly recommend The Eleventh Son by Gu Long translated by Rebecca S. Tai. It is simply the best translation of a wuxia novel I have seen in English. Plus the novel is exciting and a fast read. Another print series worth checking out is the Heaven Sword and Dragon Saber comic illustrated by Wing Shing Ma. This is a storyline that has been done many times in film and on television (and is based on the book by Louis Cha--a.k.a. Jin Yong) and the comic does a great job with it. If anyone's read my campaign log for Wandering Heroes of Ogre Gate, it is pretty obvious this has an influence so I I've been recommending this series to my players. The artist has done a number of other wuxia series as well that are worth checking out. A book I recommend to players who seem more interested in the academic side of film is Chinese Martial Arts Cinema: The Wuxia Tradition by Stephen Teo. Another book worth recommending, though it is very long, is The Water Margin. This is a classic novel, not modern wuxia, but it has a lot of the elements you see now. This comes in a number of different translations and players can get a lot of ideas just by reading the odd chapter here or there (if they read the whole thing, great, but it may be enough for them to just read a few chapters to get a sense of things). Another question: I'd like to run a short game to familiarize myself and my players with the Network System before Wandering Heroes of Ogre Gate's release. They're familiar enough with the wuxia genre, and I own Servants of Gaius, Sertorius, and Terror Network (all as PDFs). Which of them would be best used as an introduction to the system -- especially combat-wise? I assume not Sertorius, since it seems very geared toward long-term play, but moreso because I don't want to introduce one fantasy world for them to get attached to, only to introduce another soon afterwards. But if it's still your recommendation, I'll try it! I would recommend Servants of Gaius. It is a good introduction to the core system (though Sertorius has a completely different sub-system for magic and Wandering Heroes of Ogre Gate uses a similar mechanic for its Kung Fu Techniques). I would also advise freely using Sertorius monsters in Wandering Heroes of Ogre Gate. If you are concerned about linking a Sertorius and Wandering Heroes of Ogre Gate Campaign, the two settings are connected in that they share a cosmology and in theory a portal could take a party from one world to the other. Still I think because Servants of Gaius is much simpler and much shorter, it is a better intro to the game. Whoa, thanks again for the reply! That's all duly noted, especially about using Sertorius monsters. I'll focus my efforts on Servants of Gaius, then, and I might take some Sertorius monsters for it, too. Take care!